How the three presidents involved have approached the topic. The narrative and goals for what has become America’s longest war have shifted in the past 16 years, and they may take a new turn Monday night, as President Donald Trump is expected to announce his policy approach for Afghanistan. The war started in October 2001 in the wake of the September 11th attacks, under then-President George W. Bush, and after Obama, Trump is now the second president to inherit -- and have to make a decision on how to handle -- the ongoing conflict. "These carefully targeted actions are designed to disrupt the use of Afghanistan as a terrorist base of operations, and to attack the military capability of the Taliban regime,” Bush said in an address from the Treaty Room of the White House. 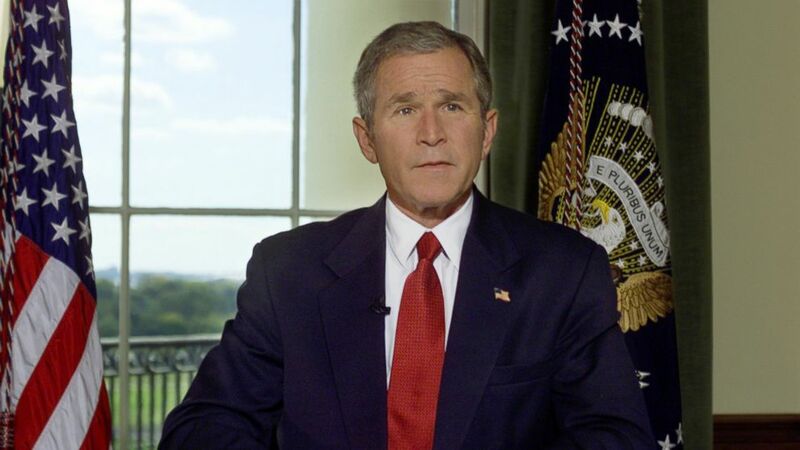 The timing of the military action is key, as Bush’s announcement came 27 days after coordinates terror attacks that killed nearly 3,000 people in the U.S.
(Hillery Smith Garrison/AP) President Bush poses for a photo in the Treaty Room of the White House in Washington, D.C., Oct. 7, 2001, after announcing airstrikes on Afghanistan. "The very original reason and the impetus was 9/11,” said Vanda Felbab-Brown, a senior fellow at the Brookings Institution, She notes how the belief that “the Taliban was sheltering al Qaeda” drove the focus on Afghanistan specifically. "The counterterrorism objective became the dominant principle reason for the effort in Afghanistan,” she added. "But very quickly, even the George W. [Bush] administration realized that this was problematic -- that it wasn’t just enough to topple the Taliban, and that it had to leave behind some sort of stable government. But both the W. administration and the Obama administration, and now the Trump administration have been debating that: what is required of the counter terrorism objective,” she said. Part of the problem has been that the role of the counterterrorism objective expanded, Felbab-Brown said, noting how "a lot of other interests were added as the mission was developing." One such addition was the fight for and promotion of women's rights in Afghanistan, a cause that became a big part of then-first lady Laura Bush's agenda. She gave the president's weekly radio address on Nov. 17, 2001, on the topic, and it coincided with the release of a report titled "Report on the Taliban's War Against Women" by the State Department's Bureau of Democracy, Human Rights and Labor. "Afghan women know, through hard experience, what the rest of the world is discovering: the brutal oppression of women is a central goal of the terrorists," Laura Bush said in her radio address. "Civilized people throughout the world are speaking out in horror -- not only because our hearts break for the women and children in Afghanistan, but also because in Afghanistan we see the world the terrorists would like to impose on the rest of us," she said. A similar sentiment was echoed by Obama eight years later, when he called it a war of necessity during a speech to a Veterans of Foreign Wars group. 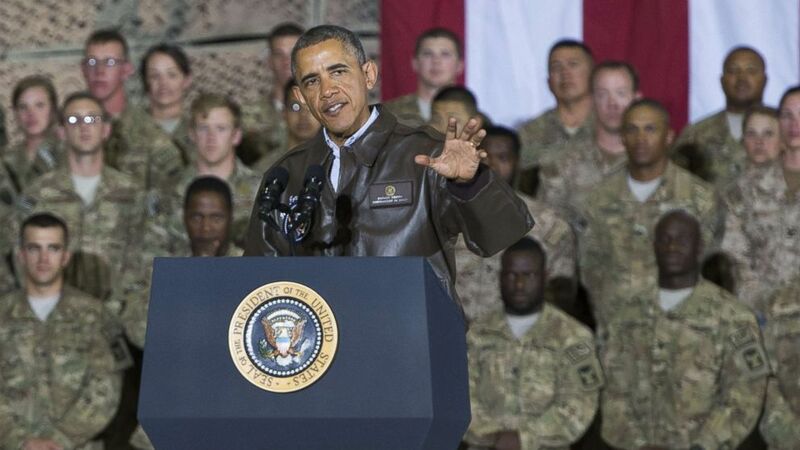 (Saul Loeb/AFP/Getty Images) President Barack Obama speaks during a surprise visit with U.S. troops at Bagram Air Field, north of Kabul, in Afghanistan, May 25, 2014, prior to the Memorial Day holiday. Felbab-Brown notes that this speech was in keeping with a larger contrast that Obama painted between Afghanistan and Iraq, indication that the conflict in Afghanistan is necessary, while the one in Iraq is “the bad war,” she said. "[Obama] wanted to get out” of Afghanistan, Felbab-Brown said, adding that “he tried” but was unable to, largely because the question of what the goal of the counterterrorism operation was lingered. "The core interest is still the counterterrorism objective, but how one goes about achieving it has been a major source of debate for W., Obama and now Trump,” she said. Trump’s exact plans have been unknown since he took office. Because of his lack of specifics on the issue in the past, it is not exactly clear what changes – if any – are called for. "During the campaign, Trump spoke almost not at all about Afghanistan. It was a non-issue,” she said.